This safari covers the magical Maasai Mara National Reserve and the Great Rift Valley lakes of Naivasha and Nakuru. The itinerary is perfect for the travelers looking for an adventurous safari. Maasai Mara is globally famous for its exceptional population of lions, leopards, cheetahs, elephant, rhino (big five), and the annual migration of zebra, Thomson's gazelle, and wildebeest to and from the Serengeti every year from July to October, known as the Great Migration. Lake Nakuru attracts the vast quantity of flamingos that famously line the shore. Other birds also flourish in the area, as do warthogs, baboons, and other large mammals. Black and white rhinos have also been introduced. Lake Naivasha offers more than enough attractions from boat riding, bird watching, crater lake, and Hell’s Gate National Park. Walking is permitted in the park, making it ideal for hiking, biking, and rock climbing. You will be accommodated in a budget camping facilities in Maasai Mara, Lake Naivasha, and Lake Nakuru. At 08:00, you will depart from Nairobi to Maasai Mara, passing through the eastern escarpment of the Great Rift Valley. You will then have a stopover at the viewpoint at 2,200 meters above the sea level. The views of Mount Longonot hundreds of meters below on the Rift Valley floor are spectacular. A highlight of this journey is the first glimpse of the Mount Suswa along the way. Mount Longonot and Hell’s Gate National Park may be glimpsed to the north, while the plains seem to sweep on forever to the south. You'll have a stopover in Narok town for lunch then further proceed to Maasai Mara and you will arrive at your camp for check-in. Later in the evening, you will embark on your first game drive to explore Maasai Mara. You shall discover Maasai Mara National Reserve, immerse yourself in this prime wildlife area and connect with nature on every level. Variety is what distinguishes the exceptional from the mundane and this reserve offers copious amounts of variation. The evening is the best time of day to view nocturnal hunters who prepare for their nightly expeditions. Watering holes are also usually busy just before sunset as animals such as hippos return to their resting spots while others congregate to drink before retiring for the night. Later, you will return to your accommodation for dinner and overnight. Today, you will get full day morning and afternoon game drives. You will enjoy a picnic lunch with the hippos and crocodiles at the hippo pool in Mara River. On this day, you can also opt for hot air balloon ride or Maasai village visit. You shall enjoy a pre-breakfast game drive between 06:30 and 09:00. You will return to the camp for breakfast and after which you'll depart for Lake Naivasha. You'll have your lunch en route and arrive at your hotel for check-in. In the afternoon, you can enjoy a boat ride (optional) to discover Lake Naivasha where you can visit the Crescent Island. After breakfast, you will head for a game walk / drive in Hell’s Gate National Park after which you will drive with en-route lunch to Lake Nakuru National Park for an afternoon game drive. You'll proceed to check-in at your hotel for dinner and overnight. You will have a morning game drive in Lake Nakuru National Park after your breakfast. After your game drive, you will depart for Nairobi and you'll be dropped your hotel or transferred to Jomo Kenyatta International Airport (NBO) for your outbound international flight. Notes: You are ‘guests’ in the national parks. The wild animals have right of way all the time. It is important to respect them and not try to touch them or make any noise to attract their attention. Maasai Mara National Reserve is the most famous and most visited reserve in Kenya. Covering an area of 1510 square kilometers, the Maasai Mara reserve is, in fact, the extension in Kenyan territory of the vast Serengeti Park in Tanzania. Together, they constitute a huge ecosystem in which animals move freely. All large African animals are present. Thomson’s and Grant’s gazelles, impala, Kirk’s dik-dik, bushbuck, topi, buffalo, ellipsen waterbuck, eland, and giraffe, all are there. Famous for its rich wildlife, the Maasai Mara is home to not only the Big 5 (elephant, lion, buffalo, rhino, and leopard) but also many birds (over 500 species of birds have been recorded). Along the rivers, crocodiles and hippos lie in wait. Lake Naivasha is the furthest south of the lakes in the Rift Valley. It is derived from the Maasai name ‘Nai’posha’, meaning ‘rough water’ in reference to the sudden storms that may come up over the lake. Lake Naivasha covers nearly 139 square kilometers and is surrounded by a marsh of 64 square kilometers. Spread around the lake are rich green plains supporting zebra, hartebeest, waterbuck, buffalo, impala, giraffes, monkeys, and, at night, hippos. There is also an important bird population (over 300 species of birds) including African fish eagle, osprey, jacana, and black rail. Later, you shall return to your accommodation for dinner and overnight. Lake Nakuru is a soda lake whose waters are often covered by a living carpet of thousands of flamingos and plains that are home to the lion, rhino, leopards, and large herds of waterbuck. Created in 1961 to protect the alkaline lake of the same name, the park offers typical plains vegetation. Lake Nakuru derives its name from the Maasai word ‘Enakuro’ which means cloud of dust. It is home to many herbivores including Rothschild’s giraffe, buffalo, hippo, gazelle, and nearly 55 mammals including lions, leopards, spotted hyenas, rock hyraxes, and reedbuck. 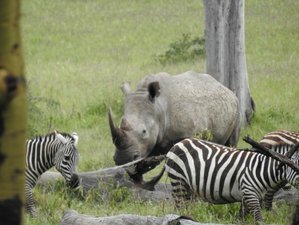 Lake Nakuru National Park is famous for hosting both white and black rhinoceros which reintroduced after many years’ absences. Lake Nakuru further renowned for the dwarf flamingos that congregate by the thousands on the shores of the lake. The park also hosts over 400 species of birds such as herons, ospreys, cormorant. Many birds are migratory birds from the northern hemisphere. During this safari vacation, you will enjoy daily delicious breakfast, lunch, and dinner. You will also be provided with one bottle of water every day. You can be taken to the skies with a hot air balloon safari that will see you soar above all of the action. You can ask your safari expert about adding a hot air balloon adventure to your safari. You can also experience how the Maasai people live in the middle of the bush with zebras grazing and lions roaring just outside their homes. You will get to know their culture and customs on a visit to the traditional Maasai village. The deposit is fully refundable if the booking is cancelled up to 18 days before the arrival date. The rest of the payment should be paid 18 days before arrival. Explorers Wild Adventures is a safari tour operator that personalizes budget and luxury safaris to provide a unique holiday and an unforgettable experience. There is also an October special offers which is available between October 5, and October 12.